This summer is turning out to be a banner year for insects! It is pretty important in a vegetable garden to get in the habit of being outside and working with your plants nearly every day. 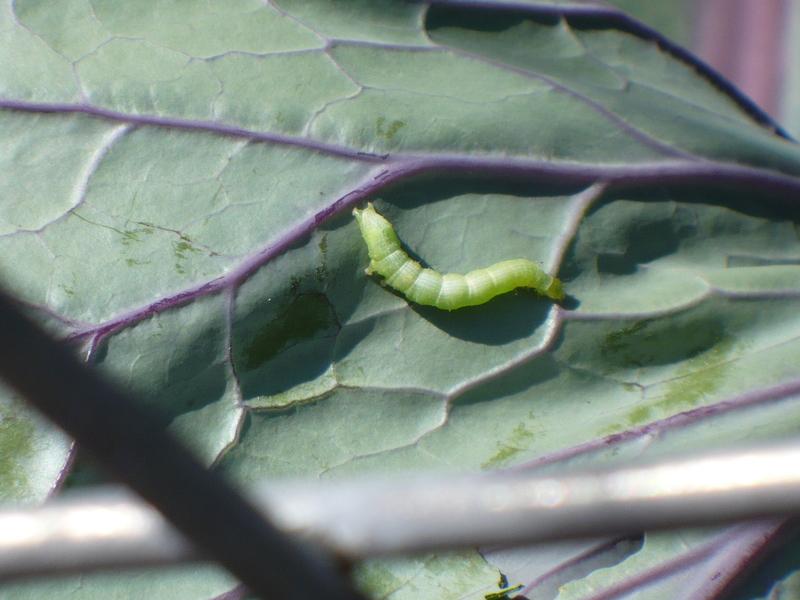 For someone new to vegetable gardening, this can be particularly important because you may not know what insect or disease problems to look for yet. I know that here in the Demo Garden, if I’m gone for 2 or 3 days, I’m always a little nervous as to what I’ll find when I return because unnoticed problems can become big problems overnight. You should do a walk through of your garden every day and look at each plant or group of plants to see how they are growing. Notice the color of the plant, any splotches on the leaves, or malformations of the leaves. These might all be signs of insect or disease problems. Look at interior leaves or leaves near the bottom of the plant because problems often start there. If you see even one or two holes in the leaves that you don’t expect, do a closer inspection. Any time you see something out of the ordinary, a closer inspection is warranted. Brush your hand over the leaves to see if anything flies off when the plant is moved. Turn over the leaves, especially leaves that show some problem to see if there are insects nearby. What do you do if you find something? If the problem appears to be isolated, like a random hole in a leaf with no signs of an insect or other problem, it may not be important. Remember where it is though, and keep an eye out for something you didn’t see or something new developing. Observe any patterns or distinctive features of the problem you are seeing. Do the brown spots on the leaves look like they have concentric circles? Are they always angular and near the veins of the leaves? Sometimes the first reaction when you see any insect or something out of the ordinary is to rush around to find something to spray. Often that is unnecessary. Sometimes you may even be seeing a beneficial insect! 1. Walk through the garden and look at the plants regularly. 2. Look at interior leaves or lower leaves to check for hard to see problems. 3. Move the leaves with your hand and turn them over, looking for flying insects, insects on the undersides of leaves, or signs of insects – discoloration, holes, insect eggs, etc. 4. If an insect is found, take a picture or capture the insect in a small container. Look through books or online resources to try identifying it. If all else fails, bring it to the Extension office and we’ll help you out! Posted on June 4, 2009, in Around the Garden, Family of 4 Garden, Insects Abound!, The First Time Gardener and tagged first time gardener, insect problems, summer garden. Bookmark the permalink. 1 Comment.